Three children die each week in Scotland from a life-shortening condition. Donating their time, energy and passion, volunteers are at the heart of our mission to reach every family in Scotland that needs us. There are so many ways that you can get involved as a volunteer, whether you have a lot of time to give, or a few hours here and there. We guarantee that you'll get more from it than you give! There are a wide range of volunteering opportunities in both of our hospices. Roles range from supporting children to participate in creative activities, to tending our beautiful gardens. If you don't live near a hospice but would like to support children and families, you might be interested in our home support service, where volunteers support families in their own homes, with practical tasks and sibling support. You'll be making a real impact on the lives of families who use CHAS services. Join our network of fundraising volunteers and meet like-minded people across Scotland who are shouting about CHAS in their communities. Fundraising roles range from collecting cheques and speaking at events to setting up a local fundraising group. There are also opportunities to volunteer in press and PR, ladies' lunch committees, and lots more. By raising awareness and money for CHAS you will be part of a fun and lively team, striving to reach every family in Scotland who needs our support. Volunteer in one of our four shops, and help raise vital funds to help CHAS reach every family in Scotland who needs us. Window dressing, serving customers, organising pop-up shop events, sorting donations, driving and delivering stock - we need people for all kinds of roles. And you'll join a friendly team at the heart of your community. You can sign up in less than five minutes to volunteer at an event near you. Our event volunteers bring enthusiasm, fun (and often a lot of noise!) to our events. Whether you're joining a cheerpoint at a marathon, wrapping Christmas presents at a shopping centre, or shaking a bucket at a supermarket collection, we'd love you to don a CHAS t-shirt and join us to raise vital funds and awareness for children and families. 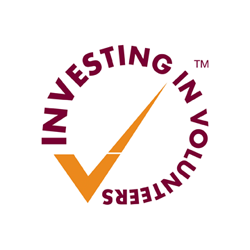 At CHAS we are proud to be the first organisation in Scotland to achieve the Investing in Volunteers quality standard. We were re-accredited for the fourth time in April 2018 and were delighted that the assessor recognised CHAS as a leader and innovator in the field of volunteering in Scotland. Investing in Volunteers demonstrates our commitment to providing a high quality experience to all volunteers in CHAS.